Are We at the Peak of Medtech 3-D Printing Hype? The medical device industry is at the peak of 3-D printing hype--but there are also many applications of the technology already in use, according to a new report. Medical technology is at the top of hype when it comes to 3-D printing, but it is also leading the way, according to a report by Gartner Inc. 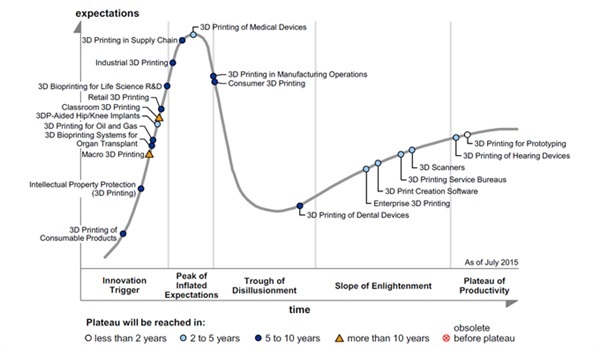 The Stamford, CT-based IT research company Gartner Inc. claims in its newly released "Hype Cycle for 3-D Printing 2015," that advancements in medtech have spurred the rise of 3-D printing in the past year, followed by innovations in the supply chain and in industry. 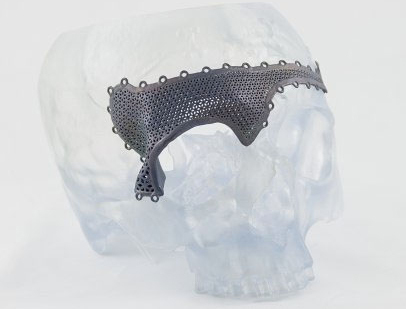 "In the healthcare industry, 3DP is already in mainstream use to produce medical items that need to be tailored to individuals, such as hearing aids and dental devices," said Pete Basiliere, research director at Gartner, in a news release. Gartner predicts that 3-D-printed hip and knee replacements, as well as other common internal and external medical devices, will be in mainstream use within two to five years. Early trials using personalized 3-D-printed replacements indicate more rapid healing and improved function of the implant as well as a greater success rate in more complex operations. Orthopedic manufacturers are already using 3-D printing to produce standard implants. Some employ it for low-volume applications in which it is cost-effective, while others print metal devices to take advantage of 3-D printing's ability to produce implants with rough surfaces, or to produce devices with complex mesh-like infrastructures to promote osseointegration. Many large orthopedic device manufacturers--such as Zimmer Biomet, Johnson & Johnson's DePuy Synthes, Smith & Nephew, and DJO Global--are using 3-D printing to make surgical guides for a range of orthopedic procedures, including total knee, total hip, or shoulder replacements. Some of the more common examples of custom implants include custom hip sockets to treat complex defects. Beyond orthopedics, researchers are experimenting with 3-D tracheal stents and custom medical implants out of resorbable plastics.Hospitals are making 3-D models of organs to detect the size and location of tumors, while others are using it in surgical planning for transplantation procedures, including those involving human faces. 3-D printing could be used to do everything from print organs on demand to create custom exoskeletons and precise medical models for engineers. Researchers at the University of Rochester (NY) are even using 3-D printing to model aortic aneurysms, bulges in the aorta that often lead to death. The transition from traditional manufacturing to 3-D printing in medtech took only two years, the Gartner report said, indicating that 3-D printing for the mass market should follow soon. Next on the 3-D medtech horizon: bioprinting of human tissue. Cosmetics company L'Oréal USA recently struck a partnership between its U.S.-based global technology incubator and tissue 3-D printing pioneer Organovo (San Diego). The idea is to leverage Organovo's proprietary NovoGen bioprinting platform and L'Oréal's expertise in skin engineering to develop 3-D printed skin tissue for potential products, as well as advanced research. Gartner is predicting mainstream adoption of bioprinting will take at least five to 10 years. 3-D bioprinting has two categories in this Hype Cycle: one focused on producing living tissues for human transplant, the other for life sciences' research and development (R&D). "The sheer complexity of the items to be printed and the high maintenance requirements of these systems mean that initial deployments will be mostly limited to specialist service providers," said Michael Shanler, research director at Gartner. "We see mainstream adoption increasing as the systems become more diverse in their functions." Learn more about cutting-edge medical devices at MEDevice San Diego, September 1-2 and MD&M Philadelphia, October 7-8.